Eating more fruits and vegetables may help you lose weight, according to a study published in "Nutrition Research" in April 2008. In the study, each 3.5-ounce increase in daily fruit consumption led to an 0.7-pound weight loss after six months. While this isn't likely to bring about large amounts of weight loss, it can add up over time. 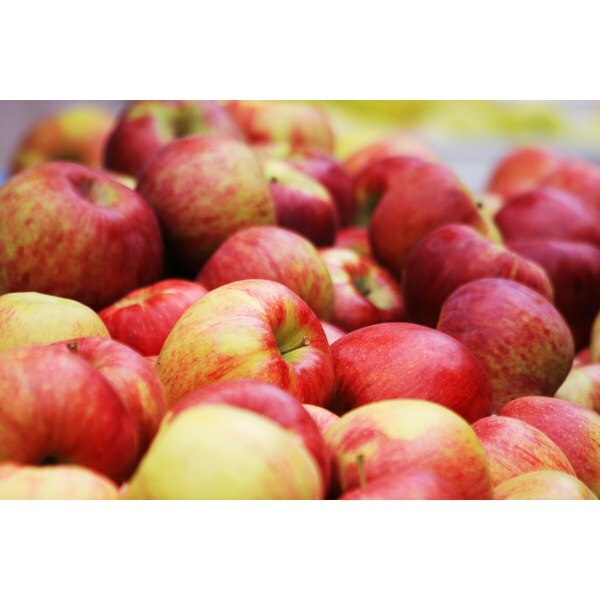 You'll also increase your nutrient intake because apples provide significant amounts of vitamin C and fiber. Foods that are low in energy density, which tend to be high in fiber and have a high water content, help fill you up without eating a lot of calories -- it is the volume of food you eat that makes you feel full, not the number of calories. Apples with the skin on have about 1/2 calorie per gram, making them a food that is very low in energy density. Snack on apple slices dipped in low-fat yogurt or spread with a small amount of peanut butter for a filling and nutritious snack, or bake a cored apple sprinkled with a small amount of cinnamon, oats and walnuts for a delicious dessert. Apples are also high in fiber, with each medium apple with the peel containing 4.4 grams, or 18 percent of the daily value. Make sure you eat the peel, as this is where much of the fiber is concentrated. People who ate more fiber lost more weight and had a smaller waist circumference than people who ate less fiber in a study published in "The American Journal of Clinical Nutrition" in December 2009. Eating an apple three times per day may help you lose a small amount of weight, according to a study published in "Nutrition" in March 2003. This weight loss of about 2.7 pounds over the course of the 12-week study might not be because of fiber alone, as the participants in the control group who ate oat cookies, which also provide fiber, didn't lose a significant amount of weight. Adding apples to your diet without taking away something else, preferably something less nutritious, won't cause weight loss. You still need to eat fewer calories than you use throughout the day to accomplish this. Each medium apple with the peel has 95 calories, so eating the three apples per day used in the "Nutrition" study would add 285 calories to your diet.